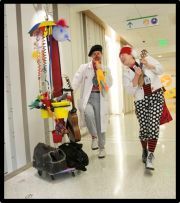 Using a playful, interactive approach, Room Circus medical clowns use music, physical comedy, improvisation and circus arts to help transform the health care environment at Seattle Children’s Hospital and the goal is to expand to other area hospitals. Stress relief, distraction, reduction of anxiety and pain and empowerment of patients are measurable benefits. Room Circus clowns reach through the barriers, pull out laughter, and create a circle of trust that encompasses everyone in the room – providers, families, patients and staff. Room Circus medical clowns are trained and experienced in the procedures, protocol and sensitivity involved in working in health care environments. They’ve learned to recognize and consider the physical and emotional state of each patient and adapt their performances to supply what is needed: raucous humor, a tender lullaby, or a visual spectacle. Coming to the Moisture Festival benefit for Room Circus on March 19th you’ll have a chance to contribute to this good cause and, perhaps, begin a new relationship with a group that you’ll be proud to be a part of.